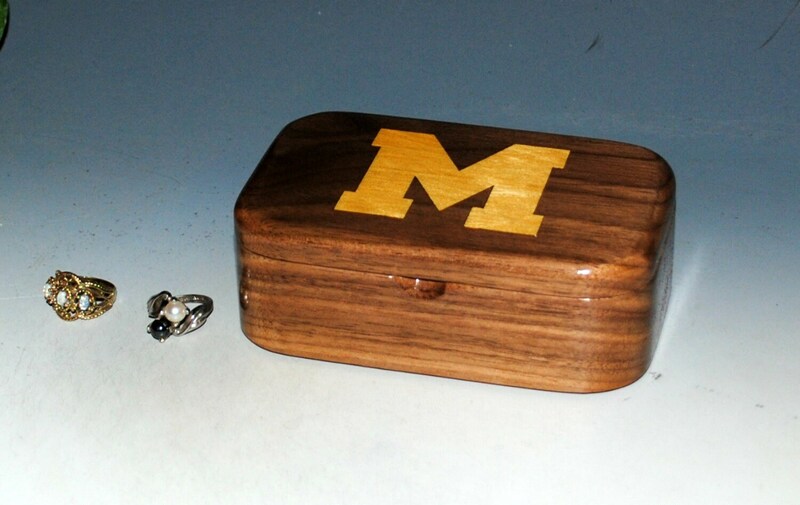 Handmade wooden box of walnut with a inlay of satinwood by BurlWoodBox of Ann Arbor Michigan. 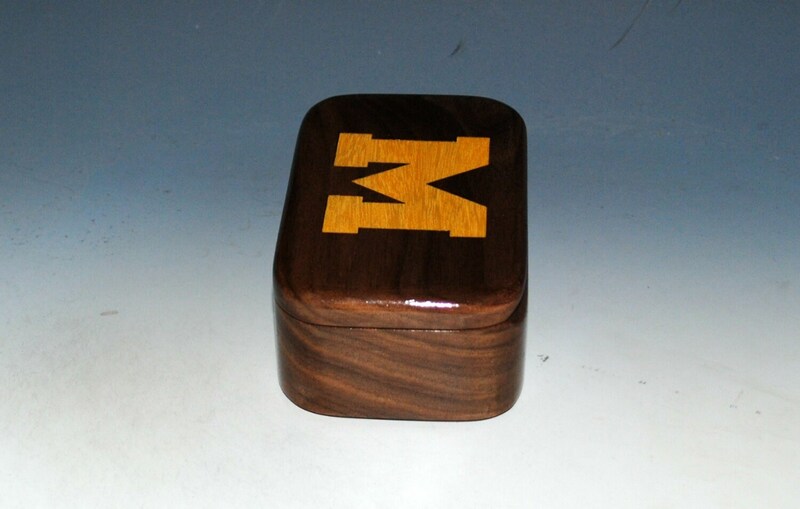 5" x 3" x 1 5/8"
University of Michigan M for the Wolverines of Ann Arbor. 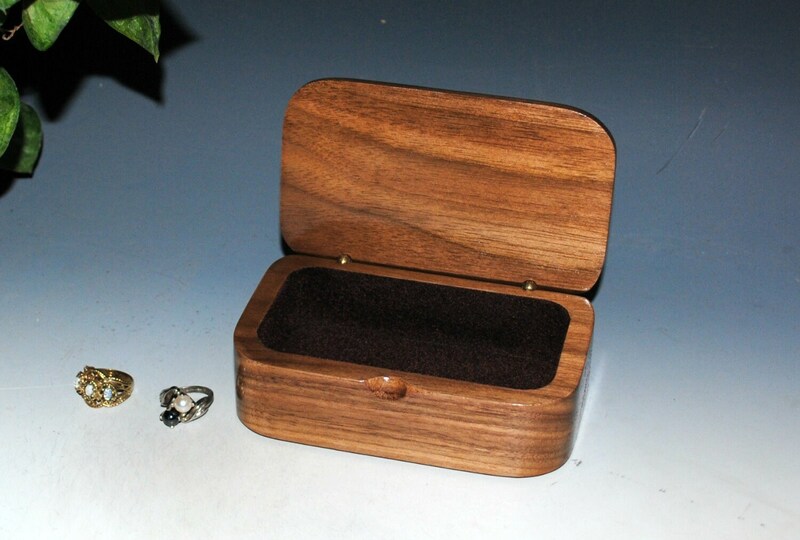 The box is walnut and the inlay S is Satinwood or Pau Amerella. 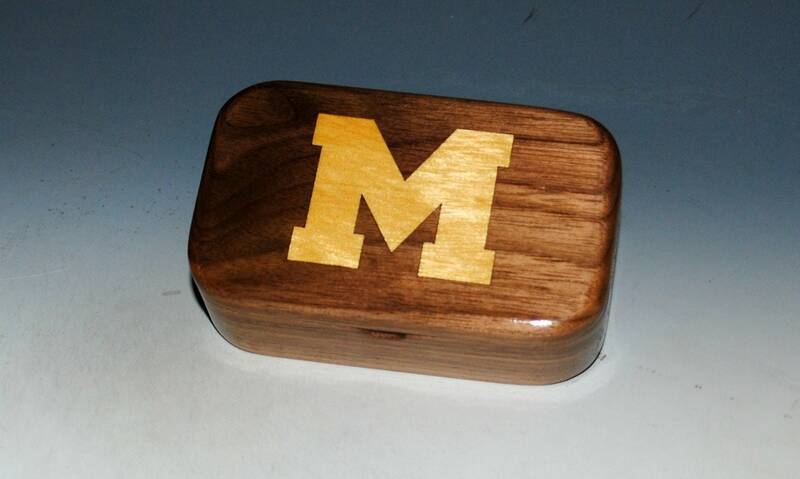 The block M for Go Blue ! 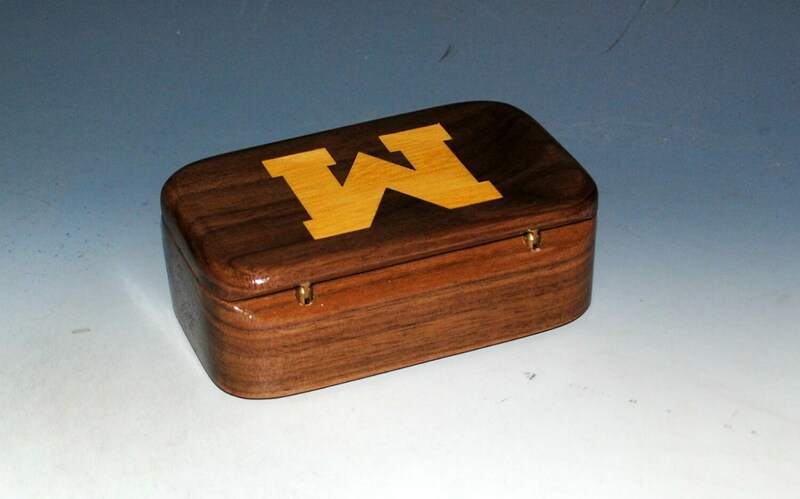 Perfect gift for the graduate or alumni. 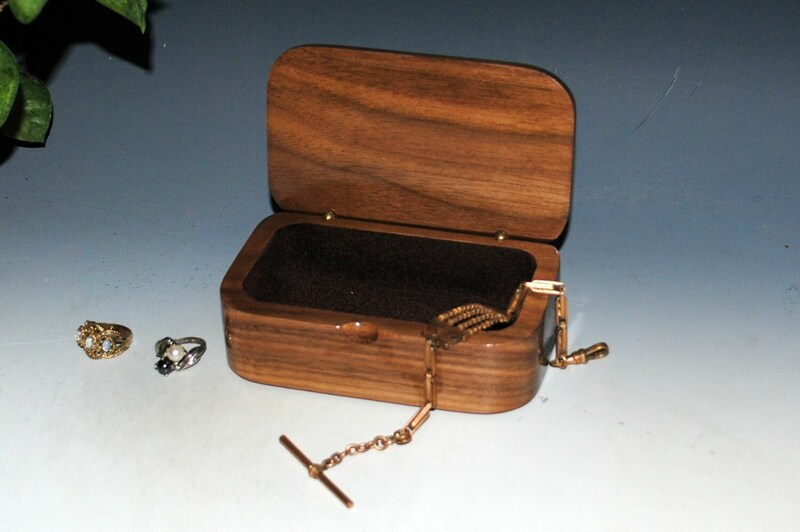 The small wood box can be used on your desk for small items or business cards, as a storage box for treasures or trinkets, or as a small jewelry box. 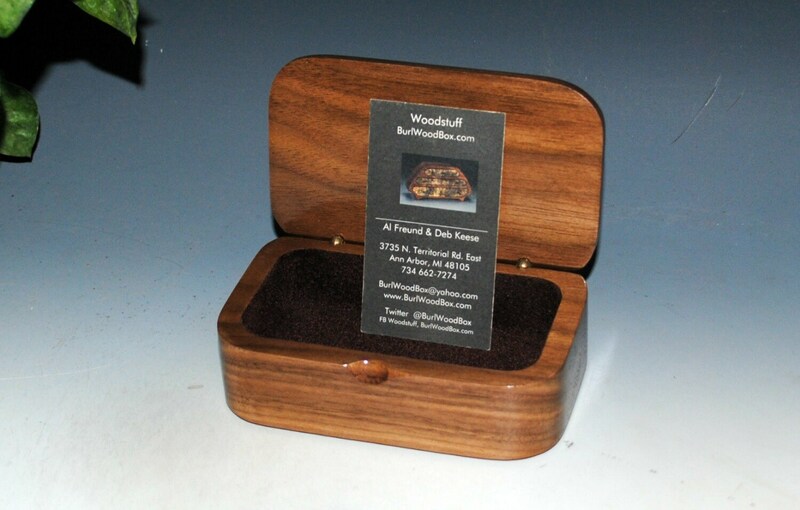 Box is lined with brown rayon flocking to compliment the dark walnut. Please note...all dimensions are approximate here as we tend to push the limits of the wood pieces we have available for each box. Your box could be a hair bigger or smaller than the above dimensions. As usual, undercoats are polyurethane with seal and finish coats being tung oil. 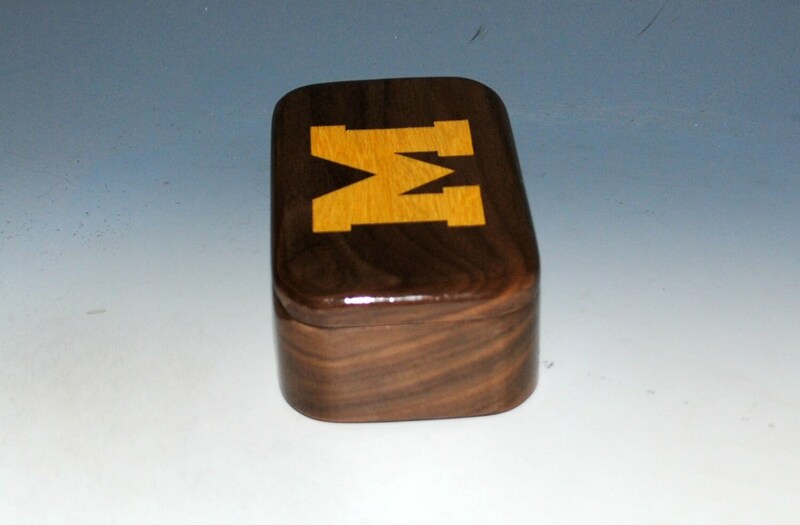 Many coats are required to produce this finish on our boxes. Shipping is via USPS Priority Mail. 2-3 day delivery to most of the USA. We utilize as much recycled and re-purposed material when packing your order for safe shipment. 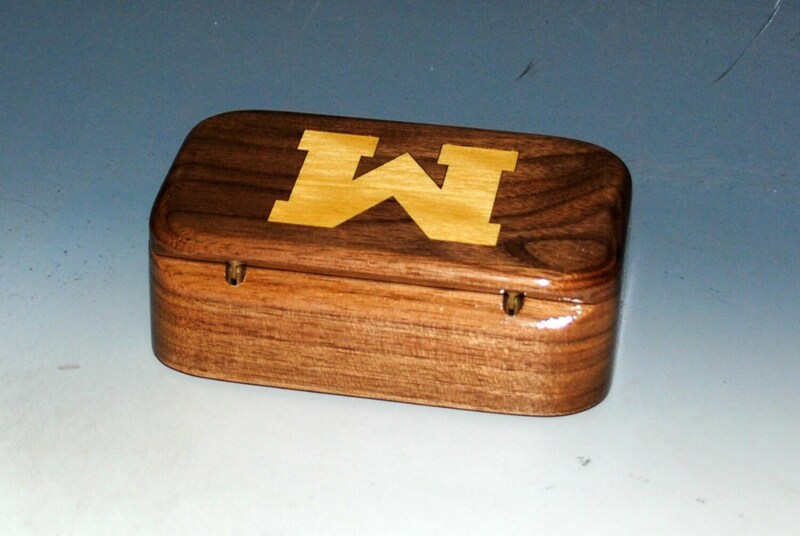 More styles of our wood boxes can be seen on our shop's home page, link follows. Thanks for visiting BurlWoodBox on Etsy ! We accept Pay Pal and direct checkout through Etsy..
All shipping is through USPS Priority Mail. Contact us should you wish an item shipped overseas. Shipping rates and policy change so quickly now that we cannot give a shipping quote overseas until we weigh your particular box purchase. We usually ship the next business day including Saturday. We accept returns on a case by case basis. Returns do not include the shipping cost. Items returned that have the holiday special free shipping will be refunded less our original shipping cost. Exchanges are permitted with an additional shipping charge. 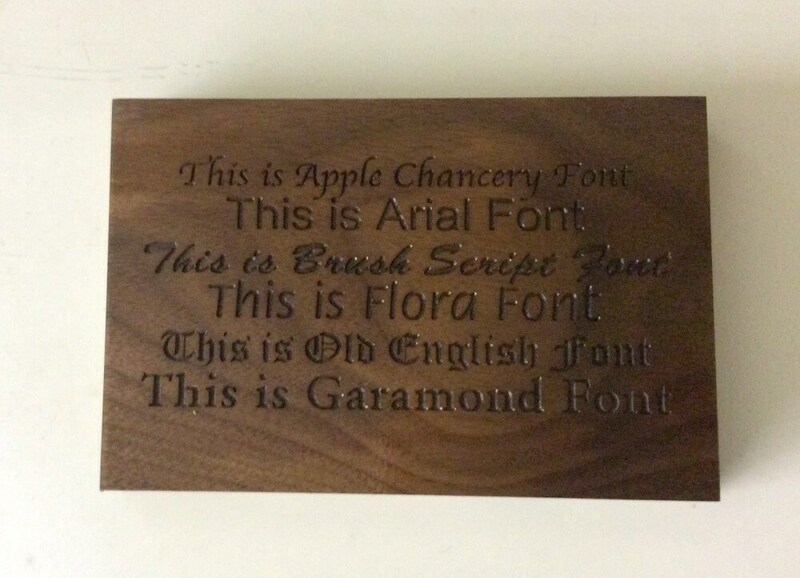 We are more than happy to discuss a custom order box as long as it falls within the parameters of a band saw box. You may give us a call or drop us an e regarding special orders or custom drawer configurations. Perfectly delighted with this handsome box! Shipped quickly. Excellent transaction in every way.